Give photos a cartoonish look. Is there a better alternative to Cartoonizer? Is Cartoonizer really the best app in Image Editing category? Will Cartoonizer work good on macOS 10.13.4? 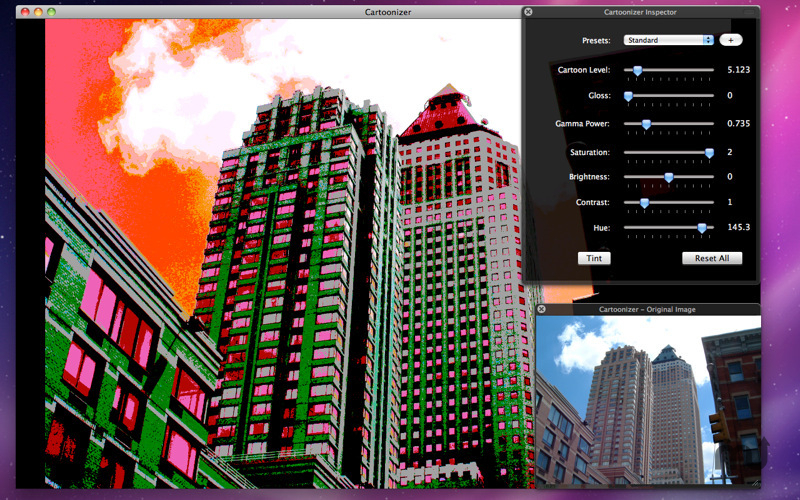 Cartoonizer instantly gives any image you can open in Mac OS X a cool, highly-stylized cartoon look. Get full control over the exact look you want by adjusting the controls in the inspector panel, allowing you to control the cartoon level, the glossiness, the gamma power, saturation, brightness, contrast and the overall hue of the image. Save your own favorite settings as presets. Corrected the window closure handling so that if changes have been made to an image the user has the chance to save them before the window closes. Cartoonizer needs a rating. Be the first to rate this app and get the discussion started!